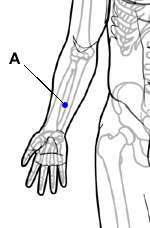 There are the acupressure points for increasing Fertility and Pregnancy . Working on these points can help you get better quicker. You do not have to use all of these points. Using just one or two of them whenever you have a free hand can be effective.See your doctor first if you have any questions or need medical advice. Location: In the middle of the inner side of the forearm two-and-one-half finger widths below the wrist crease. Benefits: Relieves discomforts during pregnancy and postpartum, nausea, insomnia, anxiety, and indigestion. Location: One-half inch below the base of the skull, on the ropy muscles one-half inch outward from the spine. Benefits: Relieves the following common complaints during pregnancy: stress, exhaustion, insomnia, head congestion, stiff neck, and swollen eyes. Caution: Do not press on disintegrating discs or fractured or broken bones. If you have a weak back, a few minutes of stationary, light touching instead of pressure can be very healing. Location: In the lower back two to four finger widths away from the spine at waist level. Benefits: Relieves postpartum discomforts, lower backaches, fatigue, sexual-reproductive problems, irregular vaginal discharge. Location: One to two finger widths outside the sacrum (the large bony area at the base of the spine) and midway between the top of the hipbone (the iliac crest) and the base of the buttock. Benefits: Relieves pelvic tension as well as constipation, urinary problems, sciatica, lower-back aches, and hip pain during pregnancy. Location: Directly between the eyebrows, in the indentation where the bridge of the nose meets the forehead. Benefits: Regulates glandular imbalances during pregnancy and relieves hay fever, headaches, and indigestion. Location: On the center of the breastbone, three thumb widths up from the base of the bone. Benefits: Relieves nervousness, chest congestion, insomnia, anxiety, depression, and other emotional imbalances during pregnancy. These points are effective for releasing abdominal discomforts during pregnancy. Location: Both points are in the pelvic grea in the middle of the crease where the leg joins the trunk of the body. Benefits: These points are particularly good for relieving impotency, menstrual cramps, and abdominal discomfort. These points are effective for releasing abdominal discomforts during pregnancy. Location: Both points are in the pelvic grea in the middle of the crease where the leg joins the trunk of the body. Benefits: These points are particularly good for relieving impotency, menstrual cramps, and abdominal discomfort.